Discover the momentous motor sporting events that took place this weekend in history …..
just five seconds ahead of Pearson’s pole-starting Holman-Moody Ford. James Hylton finished third, 10 laps behind the lead pair. Thirty drivers qualified for this 500-lap racing event that took three hours and eight minutes to complete. Most of the field was driving vehicles made by Ford. J.D. McDuffie ended up becoming the last-place finisher due to a problem with his engine on lap 20. 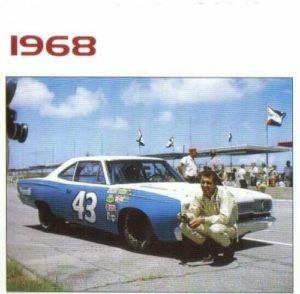 Ed Negre was the lowest finishing driver to complete the race regardless of being 206 laps behind the drivers on the lead lap. Friday Hassler’s engine problems were unfortunate enough to kick him out of the race on lap 476 with a “fortunate” sixth-place finish. Six thousand excited NASCAR fans were eager to see Richard Petty defeat David Pearson by a margin of five seconds. From the halfway point (lap 251) to the end of the event, Petty and Pearson didn’t allow the lead to escape their collective grasps. David Pearson, Bobby Isaac, and Bobby Allison all dominated the opening 100 laps of this racing event. 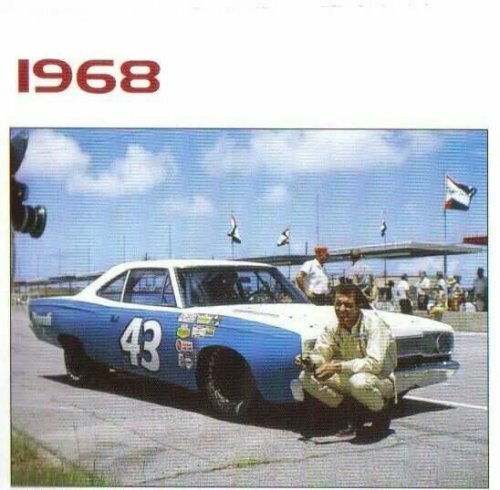 The average racing speed was 85.121 miles per hour (136.989 km/h); which was overshadowed by David Pearson’s solo qualifying speed of 95.472 miles per hour (153.647 km/h). Individual driver earnings from this racing event ranged from the winner’s share of $3,500 ($24,104.78 when considering inflation) to the lowest possible earnings of $150 ($1,033.06 when considering inflation). Organizers were authorized to hand over a grand total of $16,935 for all the qualifying drivers ($116,632.72 when considering inflation). 1969: Reinhardt Stenzel won the Sembach Hill-Climb in Germany driving an Alfa Romeo T33/2. 1971: The inaugural 2,900 mile Cannonball Baker Sea-to-Shining-Sea Memorial Trophy Dash, from the Red Ball Garage in New York City to the Portofino Inn in Redondo Beach, California was won by Dan Gurney and Brock Yates in a Ferrari Daytona coupe. Gurney, the “retired” veteran of international racing, and Yates, a senior editor of Car & Driver magazine, covered the distance in 35 hours and 54 minutes. 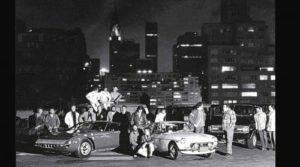 They were only 53 minutes faster than the second-place finisher, a Chevrolet Sportsvan entered by Briggs Chevrolet-Ferrari, South Ambory, New Jersey for the three co-founders of the Polish Racing Drivers of American, Tony Adamowicz, Oscar Koveleski and Brad Niemcek. The PRDA team covered the distance in 36 hours and 47 minutes.In fact, less than two hours separated the five fastest finishers, even through the event was run through rain, snow, sleet and got at various points long the routes the teams travelled.The Cannonball Baker event conceived by Yates as a whimsical gesture of defiance of the regimen of contemporary traffic laws was run without accident or injury, but the law did takes its toll.Four of the eight teams received a total of 12 speeding tickets along the route. The most remarkable among them was a citation given to Gurney in Arizona for allegedly doing 135mph in a 70mph zone. But the leading ticket-takers were the third-place finishers. Larry Opert, Ron Herisko and Nate Pritzker of Cambridge, Massachusetts, received six tickets, talked themselves out of a seventh and narrowly escaped jail for allegedly stealing gasoline at one point in their journey to California in a 1971 Cadillac – in a time of 36 hours and 56 minutes. Koveleski, a director of the Motor Racing Safety Society, pointed out that the RPDA went ticket-free “because we endeavored to remain within the speed limit at all times.” The PRDA van was equipped to run the distance without a fuel stop, having started from Manhattan at 12:11am on November 15th with 298 gallons of Gulf No-Nox on board. But the team was forced to stop in Albuquerque, New Mexico to take on 78 additional gallons of fuel. The fourth place finishers were runners-up in ticket-taking. Tom Marebut, Randy Waters and Becky Poston of Little Rock, Arkansas received four speeding tickets during the course of their 37-hour 45-minute trip. 1986: Racing driver Rick Mears set a US closed-course record at the Michigan International Speedway. Mears was timed at an average speed of 233.934 mph (376.48 km/h), breaking the record set by Mark Donahue in 1975. 1991: Mark Martin scored his first win of the season in the finale at Atlanta, Georgia (US). Dale Earnhardt clinched his fifth NASCAR Winston Cup championship by simply starting the race. 2002: Kurt Busch won his fourth race of the year at Homestead-Miami Speedway (US) and Tony Stewart coasted to an 18th-place finish to put the lid on his championship campaign. Stewart beat runner-up Mark Martin by 38 points to capture the NASCAR Winston Cup title. 2003: McLaren announced that Juan Pablo Montoya would be leaving Williams to drive for them in 2005. “The team is consistently a world championship contender and has a great heritage,” said Montoya. “It is a great opportunity for me and I am really looking forward to the first time I will be able to drive one of their cars. To join them is an amazing experience and challenge ad experience which I plan to fully enjoy.” A shoulder injury interrupted 2005, but Montoya bounced back and won three times, matching team-mate Kimi Raikkonen for speed. In 2006, though, Montoya lived the first half of the year in Raikkonen’s shadow before knocking the pair of them out at the start of the US Grand Prix. mile event at Ascot Park two weeks after. Resta won the Cup and earned 900 points, while Aitken was forced out on lap 19 with a broken valve. Resta held a 660-point lead entering the Grand Prize, with 1000 available to the winner. As World War I was waged in Europe, the cars were all American-entered, including two Peugeots entered by the Indianapolis Motor Speedway for Aitken and Howdy Wilcox. Aitken’s race ended on lap 1, with a broken piston, while Resta raced into the lead. The IMS team attempted to flag Wilcox into the pits for Aitken to take over the car, but the AAA officials denied them the change. 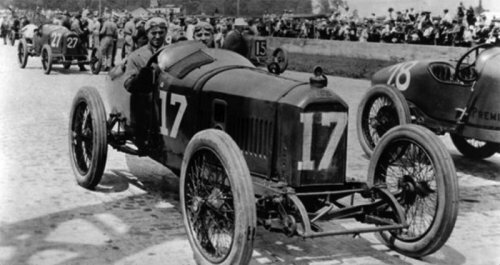 By lap 9, Resta led from Ed Ruckstell’s Mercer, the Stutz of Earl Cooper, and Eddie Rickenbacker’s Duesenberg. On lap 13, Lewis Jackson’s Marmon went through a barrier, killing Jackson and three spectators. On lap 16, Resta experienced a misfire, and retired soon after. On lap 20, Aitken replaced Wilcox in an attempt to gain as many championship points as he could. (The AAA, however, had set a precedent at Indianapolis by not awarding points to Eddie Rickenbacker in his relief drive.) Aitken led the final 22 laps and took the victory, but Resta had all but secured the championship. With the United States’ entrance to World War I in April 1917, and board track racing taking the national spotlight, road racing in the U.S. became largely dormant. Grand Prix racing did not return until 1936, and did not become a fixture until 1959. 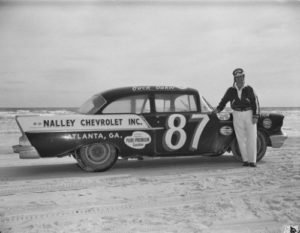 1956: NASCAR Hall of Fame inductee Buck Baker prevailed with a last-lap pass, securing a thrilling victory by one foot over Joe Weatherly at Wilson (North Carolina, US) Speedway. Speedy Thompson, who led 184 of the 200 laps on the half-mile dirt track, finished third with Fireball Roberts fourth as the last driver on the lead lap. The race marked the last win and final race for eccentric team owner Carl Kiekhafer, who savored an astounding 52 wins in just two brief seasons in NASCAR’s premier series. 1956: Ken Miles won the Cal Club Under-1.5 Liter Modified race and championship at Paramount Sportsman’s Ranch near Agora, California, US, driving the Pooper, a Porsche-powered Cooper Bobtail. 1979: Richard Petty (cover image) won his record seventh series championship, a mark that would be matched in 1994 by Dale Earnhardt. 1990: Dale Earnhardt led all but the first 50 laps as he dominated the 312-mile Checker 500 at Phoenix, Arizona (US). Earnhardt took the points lead as leading contender Mark Martin ­struggled, finishing 10th. 2002: 1980 World Champion Alan Jones was married on Daydream Island beach. The 56-year-old married Amanda Butler-Davis, the mother of his two 20-month-old twins Jack and Zara in a very private ceremony in the tropical setting. 2005: Gerard Crombac (75), nicknamed Jabby, co-founder of French magazine Auto-Sport, died. He was one of the most famous and, with a record 578 Grands Prix, longest serving F1 journalists. He lived amidst the F1 scene when a journalist still could be a close friend of team bosses like Colin Chapman and work for his buddy’s closest opponent, as was the case with Ken Tyrrell. Or acting as the manager to the late Jo Schlesser while being a very close friend to Jim Clark, with whom he shared a flat in Paris.